Get trending Salwar suits online on the leading women’s clothing store Mohmith at the best price. 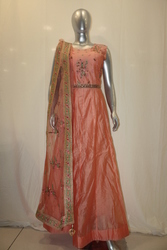 Have a look on this orange gown shaped salwar suit with attractive design suitable for any occasion . For more such chudidar suits visit our salwar suit catalogue.